History records Hippocrates as saying “The soul is the same in all living creatures, although the body of each is different.” The sentiment holds just as true today as it did millennia ago, if not more so, as we – both as individuals and as societies – increasingly recognize that the perceptions of the many species with whom we share this planet are not so different from our own. 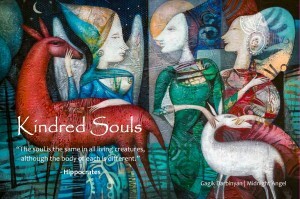 Curated by North Hollywood fine artist and fine art dealer, Hovik Kochinian, Kindred Souls is a collection of modern works that evoke a quiet sense of timeliness. The saturated colors and bold brush strokes that initially draw viewers into these engaging tableaus slowly give way to an unmistakable curiosity, as viewers are invited to wonder from whose point of view is the story being told. This event is free and open to the public. A portion of the proceeds from all art sales benefits the museum. “Any time an art show involves a life-sized rhinoceros, I think you’re off to a good start. This one happens to be completely covered in 1000, one dollar bills,” says Los Angeles Fine Art Dealer, Chuck Wolf. 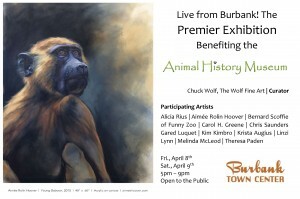 Wolf, of The Wolf Fine Art, is curating the Animal History Museum’s opening art reception. As Wolf explains, the rhinoceros is the contribution of Funny Zoo co-founder Bernard Scoffie. Scoffie also heads the French foundation 30 Millions d’Amis (30 Million Friends) an animal advocacy group started in 1976 by his family. Also contributing sculpture is Claudi Garzon, working in marine debris plastics, which call attention to the dangers of rising plastic levels in our oceans, and their threat to marine wildlife, like marine mammals, sea birds and Garzon’s beloved sea turtles.